We live in such a fast paced hi-tech world that sometimes we forget that not all our entertainment has to come from a screen or a phone. This goes for our kids too. Our children learned how to work their iPads like tech masters before they even knew how to read. It's the way our society is moving, but it's still refreshing when you find that your kids love a little old school fun and it can be just as entertaining! A few weeks ago we mentioned that we were introduced to the Ben the Rooster pen pal program. We were instantly smitten with the concept. We remember participating in pen pal programs as children and became a bit nostalgic at remembering just how fun it was to receive mail from someone else around the world. We signed up our youngest, and couldn't wait to see the excitement on their faces as they received their very first letter from Ben himself. After giving it a try and seeing them send letters back in forth with Ben, it has quickly become one of our new favorite activities! Every day the kids race to the mailbox to see if they have received a response from Ben. They can't wait to see what he's written back - what story, fun facts, activity or silly joke he's come up with. It's been so much fun to witness the joy they get out of such a simple and easy activity! Ben the Rooster sends your child two post cards a month (one on the first of the month and one on the sixteenth). Each card contains a letter filled with fun jokes, facts, and an activity/prompt for your child to write back. After your child completes his/her letter back to Ben you simply pop the postcard back in the mail. Ben has already stamped and addressed his post card for you so it's quite possibly the easiest pen pal program that ever existed! Each letter from Ben the Rooster contains a note about something fun, a sticker, and a postcard containing a writing and drawing activity for your child to send back to Ben. The writing prompt that Ben sends is usually a fun personalized question that allows the children to think creatively and both draw and write out their response. Ben the Rooster pen pal program is created with children ages 2-8 in mind. We signed up Cute (6), Boo-Boo (5), and L.C. (3) and they each have so much fun participating with Ben. Even at different literacy and writing levels they have easily been engaged in their own way with writing back Ben. It's been so cute to see each one have their own "take" on Ben's letters! How to become a pen pal of Ben's? 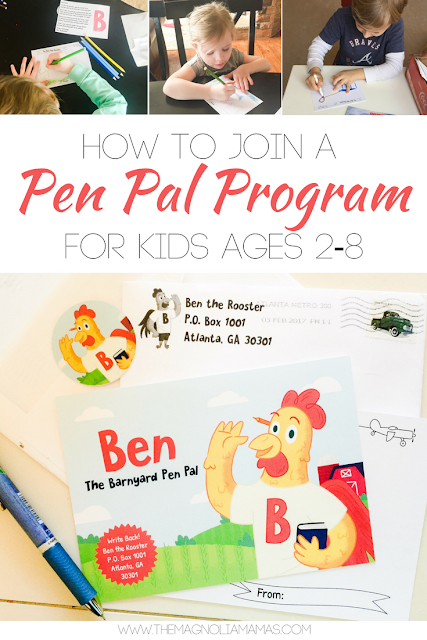 There are two options to subscribe to the Ben the Rooster pen pal program. You can choose a month-to-month option for $5 a month or a 6 month pre-pay option for $27. With both options Ben sends two post cards per month. The plans are flexible, and you are easily able to adjust your subscription online. We have found the program completely user friendly, and our kids have absolutely loved writing back and forth to Ben. We've have even loved sharing Ben as a gift to other friends so they can join in the fun too. That includes you as well!! 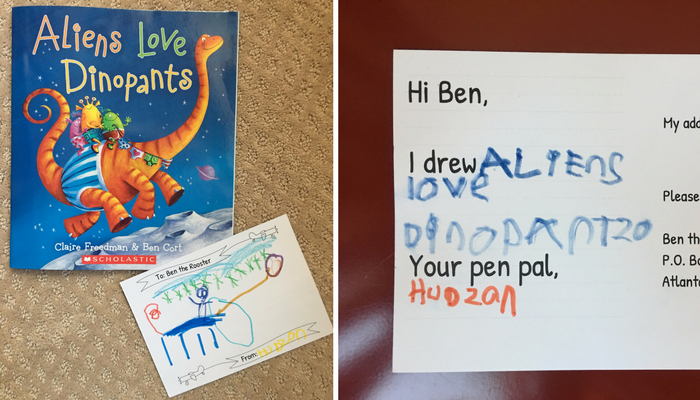 Ben has become such a good friend with us, that he wants your little one to become his pen pal too! Ben has given us a code to share for our friends to enjoy TWO FREE MONTHS of writing with him. Simply create an account with Ben the Rooster and use code MAGNOLIAMAMAS to start receiving mail from Ben too! Did you have a pen pal growing up? *** We were given a subscription to Ben the Rooster Pen Pal program in exchange for a review. All thoughts and opinions are our own. Thanks for such a kind review of Ben!